‘Tis the season for coughing, sneezing and sniffling. Many of us have stocked our medicine cabinets with vitamins, minerals and herbal remedies to ward off or cure these nasty symptoms of the common cold. Zinc supplements are a particularly frequent treatment, because zinc is known to support immune function. But do zinc supplements actually work? Zinc is thought to halt the replication of rhinoviruses, the most common cause of colds. A recent scientific analysis pooled data from previous studies that compared oral zinc treatments with placebo or no intervention. It was found that zinc had no significant effect on the severity of symptoms experienced, but zinc did shorten the duration of a cold by an average of 2.63 days in adults. Not all zinc formulations are equally effective, however. Only zinc acetate caused a statistically significant reduction in symptom duration. Zinc gluconate and zinc sulfate were not successful. So if zinc can help kick a cold faster, how much should we take once we feel the beginnings of a sore throat and runny nose? The evidence says to start using zinc within one to two days after the onset of a cold, but researchers have yet to offer an optimal dose. In the analysis mentioned above, subjects took zinc acetate lozenges every 2-3 hours while awake until symptoms resolved. By my own estimations, this provided about 54-104 mg zinc daily. Remember that more is not always better. 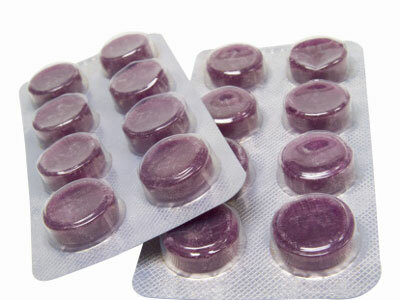 Zinc lozenges may cause a bad taste in your mouth or even nausea. Taking too many, or popping mega-dose zinc tablets can be harmful. The safe upper limit of zinc is set at 40 mg daily. Exceeding this amount for an extended period of time can actually decrease immunity and cause low copper levels. The bottom line? Zinc may help your body fight the common cold, but if you’re going to load up, do it for a maximum of 7-10 days and be wary of how much zinc you’re ingesting! Read labels and choose supplements or lozenges with zinc acetate (or zincum aceticum) as the main ingredient.